The origins of organised swimming in Dorset are lost in the mists of time, although the earliest reference belongs to Weymouth. Thanks to King George III and his family, who journeyed there for their summer holidays in the late 18th century, Weymouth was already a fashionable bathing resort when Bournemouth did not even exist. ‘Weymouth Swimming Club was founded in 1825 – we have a set of minutes,’ says club treasurer Terry Woolley. ‘It was primarily for enthusiasts of sea swimming and diving. The club also taught youngsters to swim. The club’s headquarters were at the Red Lion in Hope Square on the harbour. 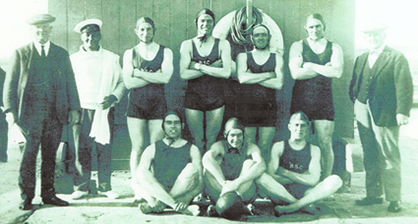 Bridport Swimming Club’s water polo team, circa 1920. Water polo was also played at 19th century Weymouth and Portland while along the coast at Bournemouth (which, along with Christchurch, was in Hampshire until local government reorganisation in 1974) the infant resort was earning itself a unique place in the history of this particular discipline. On July 13, 1876, in the sea off Bournemouth Pier, the Bournemouth Premier Rowing Club hosted the world’s first recorded water polo match. Described in a newspaper as the ‘first of a series of aquatic handball matches’, the fixture was played by two teams of seven using goals marked out by four flags which were moored 50 yards apart to the west of the pier. This and other swimming activities led in 1889 to the formation of Bournemouth Swimming Club, which survives to this day with a strong emphasis on water polo. The Western Counties ASA was formed in 1901, attracting major support from Gloucestershire, Devon and Somerset but rather less from the other three counties. In fact, a report dated 1908 indicates that of 76 clubs affiliated to the West, only three were from Dorset. In 1914 even these withdrew their membership, perhaps because of the First World War. A survey, also dated 1914, reveals the paucity of facilities in the county at that time. Sherborne had the only swimming baths and even they were privately owned by a school. At Dorchester and Wimborne people swam in the river; at Bridport, Lyme Regis, Poole, Portland, Swanage and Weymouth, the sea was the only option. Other towns were not even mentioned. It was not until 1931 that Dorset had its own county association. The Western Counties ASA called a meeting at Dorchester on March 28, 1931, chaired by the President, Brigadier G de V Welchman, and with other officers attending. Keith Sawtell, an English diving champion from Sherborne, represented the Amateur Diving Association. He had been ‘largely instrumental’ in co-ordinating the various swimming interests in the county and was elected as the first President of the Dorset County ASA. Also present were representatives of swimming interests at Bridport, Dorchester, Lyme Regis, Wareham, Wimborne and Weymouth. Blandford was among the towns not represented despite having had its own open-air pool as early as 1924 – a facility which survived until 1993. Even more surprisingly, considering the size of the town and its dependence on the sea, there was no-one from Poole. In fact, it was not until two months later, on June 1, 1931, that Poole SC was formed and affiliated to the county. Poole had recently acquired an open-air pool in Park Lake Road, described by Mr Sawtell as the best in Dorset, despite the occasional coating of soot and ash from steam engines which stopped at a traffic signal outside. Bournemouth and Christchurch, of course, were still in Hampshire, while Ferndown was just a rural village whose first pool and swimming club were more than 40 years away. The first county cups were also presented in 1931 – for diving and the men’s and boys’ 100 yards freestyle. The same year saw the first annual Poole Harbour Swim, from the floating bridge at Sandbanks to the Quay. It remained a male-only event until 1956, when Jean Holland of Poole SC was told that if she could get six ladies, they too could enter. She succeeded. In 1931, most swimmers were still using the trudgeon or sidestroke in competition but a report on a Poole gala the following year reveals that ‘the men are changing over to the crawl’. Due to the lack of pools, many events were held in rivers and the sea. At Bridport, the nearest thing to a starting block was a wooden platform in the River Brit, which could be above or below the water surface, depending on the flow of water over the sluice. ‘There was no false start rope so we dived in when the starter said, “Take your marks!”’ says Joy Grounds. ‘The first to leave gave a tremendous thrust so that the slower starters were jerked backwards. The referee and judges were on the wall well away from the race. The turn judges were in rowing boats 50 yards up river. Dave Hoskins, whose family has been involved in Bridport swimming for at least five generations, says the starter Harold Smith never disqualified anyone because there was no way to call the swimmers back. Nor, in those days, could you disqualify them at the end. Like the starting platform, the finish was a plank at the river’s edge. ‘The tactic in those days was to be first to the plank and give it a good push so that everyone else had to swim an extra yard!’ says Dave. At Wareham, swimmers swam across the river between ropes and Gina Wilcox remembers getting her feet stuck in the mud under the telegraph pole used for turning. At Weymouth, the swimmers had first to swim to the starting pontoon while the officials went out by boat. At Swanage, the vagaries of wind and tide produced a range of challenges and even moved the turning pontoon at least once. At Portland, the dockyard produced a greasy film on the water and eel-like sea weed which tended to wrap itself around the swimmers’ legs. Learning to swim 1950s-style. Jill Hoskins (nee Trevett) takes a novice swimmer through his paces off the pier in West Bay, Bridport. Joy Grounds recalls that freestyle was the only event at most competitions until the 1950s, when breaststroke and backstroke were added. Butterfly was added in the 1960s after first appearing as a separate stroke in the 1956 Olympic Games. The situation in Dorset in the 1930s contrasted starkly with that in Bournemouth, which had indoor baths at the Pier Approach and Stokewood Road – and a Bournemouth SC squad to match. In fact, Bournemouth was a significant force in British swimming, providing the national women’s relay champions in 1936 and 1937. The team included Olive Wadham (nee Joynes), who became the Bournemouth area’s first Olympic swimmer in Berlin in 1936, and Yvonne Glover, runner-up in the Olympic backstroke trials in the same year. Some interesting techniques were used for the teaching of swimming in the past. At Bridport, many trusting youngsters were attached a rope held by the teacher who walked along the pier. 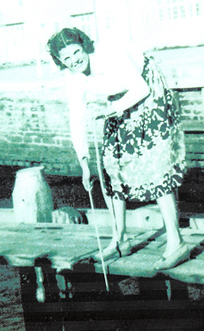 The length of rope ranged from 2 feet to 20 feet depending on the tide. Joy Grounds remembers practising the breaststroke action while lying uncomfortably on a bench in her school gym in Bournemouth. Bridport SC used a similar technique but with the swimmer’s wrists and ankles supported by straps. Water polo was a significant sport in Dorset through the middle decades of the century and, like swimming, it took place mostly in rivers and the sea. Dave Hoskins recalls that Bridport alone ran three teams in the post-war years and regularly hosted visits from such major clubs as Cheltenham and Weston-super-Mare and touring teams from London. There was a strong social side with a visit to the pub or dancing on the promenade at West Bay afterwards. There was also a Dorset League whose competing clubs included Bridport, Portland, Wareham, Weymouth, Lyme Regis and Swanage. ‘Portland were the top team in my time. The Dorset team consisted of six from Portland and me,’ says Dave. ‘Portland played in the harbour and you had to carve your way through the oil from the ships. It was a dreadful experience. But it was also terrific to have deep water to play in. At Swanage, you had to walk miles off the beach to find water deep enough to play in and the referee was in a boat at the side. At Bridport, we played in the mouth of the River Brit at West Bay. They could put a pitch in the harbour and because it was a holiday place, we used to get huge crowds watching and collected money in tins. It made Bridport a wealthy club and able to outbid other clubs in the annual auction to host county events. Sometimes Dorset’s water polo players had more than their opponents to contend with. During one match at Bridport, a dead sheep floated into the playing area while dead rats and angry swans were among the hazards at Wareham. Winds, waves and tides also influenced play. David Grounds remembers playing for Wareham in a rough sea outside the Cobb at Lyme Regis. ‘As I tried to defend the goal, I was looking down on the home team’s forwards and the next second looking up as a wave took the same forwards 10 feet above me,’ he says. ‘The sea was so rough that they had to get boatmen to tow the pitch – an arrangement of ropes and goals supported by corks – inside the Cobb to restart the match. For the last three or four decades, there has been little or no organised water polo in Dorset (except by Bournemouth SC, which retained its Hampshire ASA affiliation until this year). Happily, however, mini-polo leagues are contributing to a revival and today’s 75th anniversary festival will culminate in the first Dorset water polo final for many years. Mini polo match at DCASA’s 75th anniversary Festival of Swimming in 2006. Diving was relatively simple in the early decades – just a plain header with no tariffs. Swanage hosted the county championships for many years as they had a 10m board, other fixed boards and a springboard. Wareham had a one-metre board but its height above the water varied according to the state of the tide and competitors often had to wait before a championship could begin. In the late 1960s, the army built a 25m indoor pool at Bovington, whose facilities included 1m, 3m and 5m diving boards. Bryanston School, near Blandford, had boards in the 1970s and 1980s. In post-war Poole, the original Wessex Diving Club dived into the harbour from boards mounted on scaffolding. After a break of a few years, the club was reformed in 1976 and the present club, based at the Dolphin Pool, is celebrating its 40th anniversary this year. There is also some competitive diving at the Boscawen pool at Portland. Dorset’s first synchronised swimming club started as a section of Weymouth SC about 25 years ago and became part of West Dorset Warriors when that club was launched in 1988. Flamingoes Wessex, who train at Ferndown and Christchurch, began as Ferndown Flamingoes in 1983 and recently absorbed Poole Penguins, which started life as a section of Poole SC. Marc Newman, who swam for both Poole SC and Ferndown Otters, has been the most successful of Dorset’s many open water swimmers, twice winning the World Cup 25m event in Lake Windermere and Lake Geneva and representing Great Britain in the first open water event to be held in the FINA World Championships. He also swam the Channel five times. Of Dorset’s other Channel swimmers, the most notable are Sam Rockett, who was the first Briton home in the 1950 International Cross-Channel race, and Samantha Druce who, aged 12, became the youngest swimmer to complete the crossing in 1983. The 1970s saw the beginnings of a revolution which was to take Dorset out of the aquatic dark ages and into the modern world. One key feature of these changes was the construction of indoor heated pools across the county. Weymouth’s 25m public pool and learners’ pool opened in March 1974 followed by Poole’s 33.3m Dolphin pool plus learners’ pool and diving pit later the same year and Ferndown Sports Centre in 1976. Other facilities have since followed at Wimborne, Dorchester, Wareham, Weymouth (Thornlow School), Blandford, Gillingham, Bridport, Parkstone (Rossmore Leisure Centre), Clayesmore School, Bryanston School, Milton Abbey School and Portland (former Royal Navy pool). Some of these pools have led, directly or indirectly, to the formation of new clubs, among them Ferndown Otters, whose appearance in 1976 and rapid ascent as a competitive club did much to change the balance of power in Dorset, Tornadoes of South Dorset (formerly Thornlow Tornadoes), West Dorset Warriors, Bridport Barracudas, Wimborne, Bere Regis, Clayesmore and, most recently, Gillingham Turbos. Sadly, Portland Dolphins folded in 2002 after 30 years. Since Weymouth hosted the ASA National Masters Championships in 1984, the county has built a strong masters squad drawn mainly from Weyport, Poole SC, Bournemouth Dolphins and Wareham. A second significant development was local government reorganisation in 1974, which brought Bournemouth and Christchurch into Dorset. Swimming clubs within those two boroughs were able to choose whether to remain with Hampshire and the Southern Counties ASA or move to Dorset and the West. Initially all those clubs opted to remain in Hampshire and the South. Bournemouth Dolphins were the first to make the move into Dorset in the early 1990s followed three or four years ago by Seagulls from Christchurch and this year by Bournemouth SC bringing a heritage dating back to 1889 and a wealth of experience in water polo, which has been largely neglected in Dorset in recent decades. The boundary change has also added several pools to Dorset’s stock including Littledown (opened in 1989 and now the main venue for the county championships), Kinson, Stokewood Road and Two Riversmeet at Christchurch. Another new pool is planned for north Bournemouth. 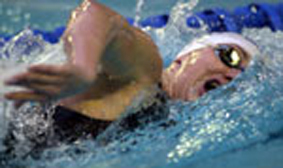 As the number of both pools and clubs has increased, so too has the standard of swimming in Dorset culminating in Karen Legg’s selection for the Commonwealth Games in 1998 and 2002 (when she won five medals) and the Olympic Games in 2000 and 2004. Alex Savage has swum at World and European Championships, Marc Newman in the first open water event at the World Championships and Shelley Reeves, Holly Fox, Charlotte Evans and Seth Chappels at the European Junior Championships.